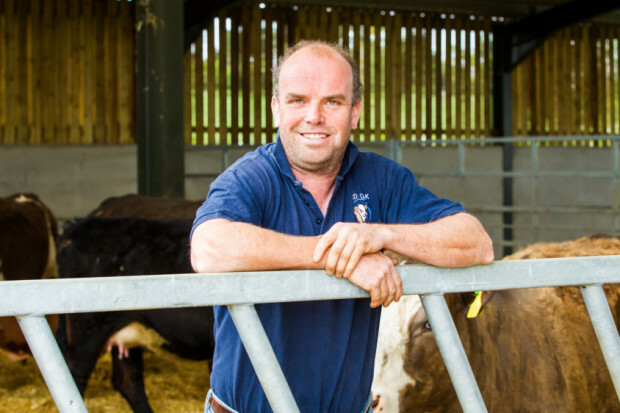 George has been nominated for the Innovation Award for his production of beef at Red Oak Farm, as part of Owen Farms Ltd, which he supplies to M&S through Dawn Meats. The commercial herd at Red Oak Farm is a mixture of Hereford, Simmental and Aberdeen Angus-cross cattle and numbers around 120 breeding animals. George is currently working to expand the herd to 200 breeding cattle and also to develop a pedigree red Aberdeen Angus herd. Under George’s direction, the farm has also undergone considerable investment, with a new buildings complex and handling systems put in place to allow room for future expansion. To maintain the high health and welfare of his cattle, he has embraced new technologies and has recently purchased a thermal imaging camera to help him locate problems with his cow’s feet and hips. This allows for faster identification of problem cows, targeted treatment and has significantly reduced the use of antibiotics within the herd.